This Ikon tyre (660B) is designed for racing. 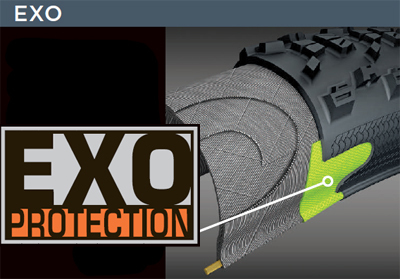 With 3C Triple Compound Technology, EXO sidewall protection, EXC casing technology, & fast rolling tread design, the Ikon provides exemplary performance in all racing conditions. Also Tubeless Ready as well. Maxxis 3C Triple Compound mountain technology uses a harder, longer lasting base layer and two progressively softer top layers in order to optimise traction and stability. Maxxis offers three different configurations of their 3C Triple Compound mountain technology; Maxx Speed, Maxx Terra and Maxx Grip. Maxx Speed is used primarily in cross country and endure tyres. The two compounds in the outer layer are specially formulated to reduce rolling resistance and optimise treadwear and traction. Maxxis Ikon 3C EXO EXC TR 650B Folding Tyre is rated 4.5 out of 5 by 2. Rated 5 out of 5 by Wheels100 from These tyres does what it says. Used these for a 750km ride and needed something that rolled well on gravel. It performed like it should with minimal fuss. I didn’t have to touch them at all. Great tyre! Rated 4 out of 5 by Dave6uw from Fast tyre This tyre is light and very fast rolling, has good grip on tarmac, gravel and on dry tracks. its OK on wet tarmac and gravel but slips in mud. Down side is that it is prone to punctures from thorns and stones as the carcass is quite thin. However I run tubeless so not to much of a problem.